Darrell and Aaron getting their wheels in motion at the Avantidrome. Riding along on a bike, with the wind in your hair, has got to be one of the most freeing sensations people can experience. However, for Allan – who as well as being both severely intellectually disabled and autistic, is unable to communicate verbally – this is just one of the many experiences that had never been a possibility for him, until now. Seeing Allan enjoying speeding around at Cambridge’s Wheels in Motion, egging the driver of the rickshaw on to do more and more laps as others sped by on their own bikes, gives a small perspective of what an amazing experience it must be for him. 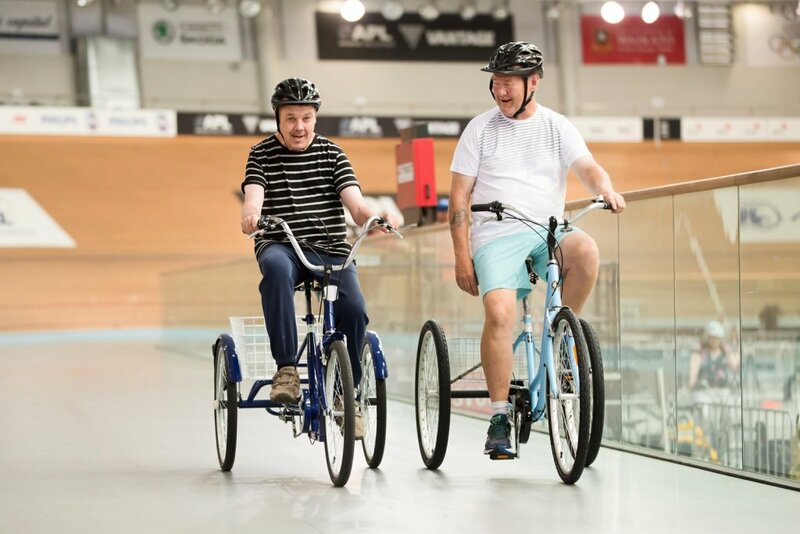 Set up and run by Aaron Ure, Wheels in Motion is an initiative that helps the disabled and ageing recover their mobility and independence through cycling. Jade Connolly, Allan’s community facilitator at ConneXu, said he was unsure how Allan would enjoy Wheels in Motion before they arrived. As it turned out, Allan was fascinated by the huge undercover space at the Avantidrome (where Wheels in Motion takes place), spending the first session looking around him in wonder. Darrell, one of Allan’s flatmates, also visits Wheels in Motion every week. Also supported by ConneXu and always keen to do his own thing and move on his own, Darrell took to Wheels in Motion easily. Jade added that there has been another benefit for the men in attending Wheels in Motion – the social aspect. “There is so much care and support shown between the participants. It is a new avenue for building friendships, where otherwise they may not have that opportunity to interact with other individuals like them, with varying needs from all over the Waikato. The shared act of facing a new challenge in life means that you have something in common, and it breaks the ice.” In fact, Jade plans to get some of the cyclists from Wheels in Motion together for a coffee in a couple of weeks.